- Positions available from Engineering Careers! The IEEE Canada Board Meeting took place on Friday May 2nd, 2014 in Mississauga, Ontario. Delegates from across the country gathered for training workshops and strategic planning for the upcoming year. Is somebody close to your heart graduating this year from a Canadian University or College engineering or science? In recognition of their success, consider a donation to the IEEE Canadian Foundation (ICF) to support the vital role IEEE has in the professional development of so many students. Get an early start on your 2013 donations - your donation to ICF, a Canadian registered charity, is tax deductible. IEEE Canadian Foundation held its 2014 Annual General Meeting, at the Delta Airport West, Toronto, on April 16, 2013. The Board supported by the external auditors, recognized 2013 as another good year for philanthropic activities, exemplified by prudent financial management, rigorous review of applications and broadening of development activity. The 2014 Dr. Robert T. H. Alden Scholarship was awarded to Sri Selva of University of Ontario Institute of Technology. The IEEE Power Quality Award for 2014 in the amount of $1,500 was awarded to Shafi Khan of the University of Alberta. No applications have been received. This award will remain open per established practice. To help you make a great first impression, IEEE partnered with OptimalResume, a career services company in Durham, N.C., to create IEEE RésuméLab, an online program that helps you with the many tasks needed for landing a job. This includes writing better résumés and cover letters, creating a portfolio or a video résumé, and improving your interviewing skills. Launched in January, IEEE RésuméLab is free to all IEEE members. Positions available from Engineering Careers! For more information: look up a job under the following link http://www.engineeringcareers.ca/. The IEEE PES is now accepting applications from undergraduate students in the US & Canada for the PES Scholarship Plus Initiative. This scholarship provides multi-year scholarships and career experience opportunities to qualifying U.S. & Canadian electrical engineering undergraduate students. As long as the scholar continues to meet renewal standards, he or she will receive up to three years of funding — US$2,000 the first year, $2,000 the second year and $3,000 the third year — interspersed with up to two years of valuable, hands-on career experience. The deadline to submit an application is June 30, 2014. For detailed up-to-date information about this new initiative, including application requirements and how to apply, please visit the PES Scholarship website. Haque Israat from	Northern Canada Section was elevated in April. The IEEE Canada Awards Dinner was held on Monday May 5th, 2014 in Toronto as part of CCECE 2014 activities. Seven achievement awards as well as 4 service awards were presented at this Dinner. Congratulations to the award winners! 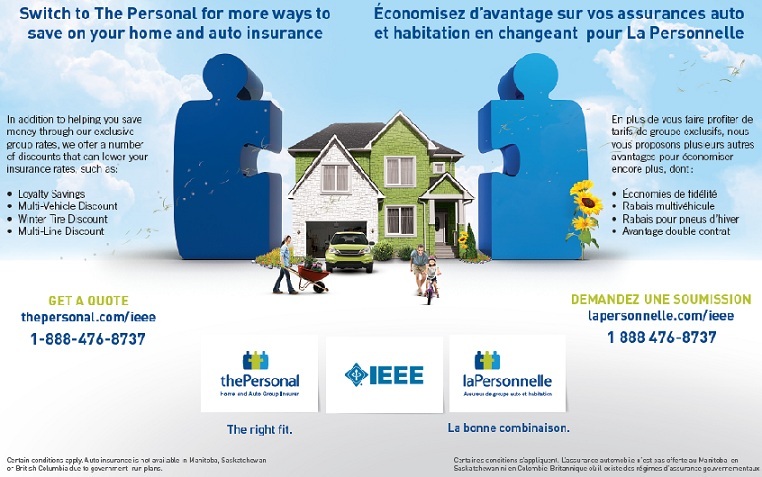 The Personal is proud to partner with the Institute of Electrical and Electronics Engineers to bring you home and auto insurance designed to suit your needs. Since 1974, members and employees of over 600 professional organizations like yours have made The Personal their trusted partner. As a member of IEEE, you are entitled to exclusive group rates plus a suite of discounts on both your home and auto insurance. What's more, your spouse and dependants can benefit from your group offer. Get a home or auto insurance quote in as little as 10 minutes. They'll ask the right questions to provide you with the best insurance protection. You could instantly win 1 of 100 $150 gas cards and also be entered into the grand prize draw to win your choice of a Ford Explorer, Ford Fusion Hybrid or a Ford Super Duty Truck! Get a home or auto insurance quote to enter or click here for more details: thepersonal.com/meetyourmatch. The Personal refers to The Personal General Insurance Inc. in Quebec and The Personal Insurance Company in all other provinces and territories. Certain conditions apply. Auto insurance is not available in Manitoba, Saskatchewan or British Columbia due to government-run plans. No purchase required. Contest closes December 31, 2013. For instant prizes: one entry per person per e-mail address. For the grand prize: one entry per person per type of insurance. The grand prize draw to take place on January 17, 2014. * Total prize value is $50,000: car valued at $35,000, plus $15,000 in gas cards. Complete rules available at thepersonal.com/meetyourmatch. Vehicles may not be exactly as shown. Ford Motor Company of Canada, Limited is not affiliated with this contest or with The Personal. 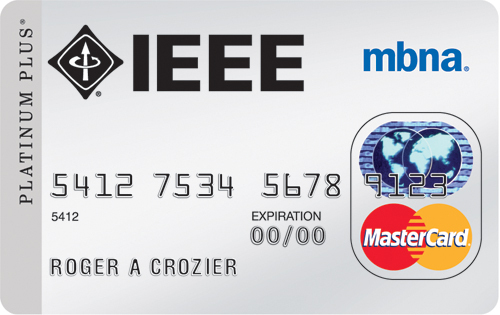 Every time you use your card for a purchase, a financial contribution will be made to the IEEE on your behalf! Thanks to recent insurance carrier negotiations, IEEE members residing in Canada (except Quebec) now have access to a comprehensive and competitive alternative for their professional liability coverage. The new plan provides coverage for technology-related services and is ideal for Canadian members who are self-employed, moonlight, or work for a firm. For more information, visit: www.ieeeinsurance.com/canadapl or call Erin Flett at 1-416-865-3353. This coverage is available to residents of Canada through R&Q Risk Services Canada Limited. Scott Saddington, Chief Executive Officer of R&Q Risk Services Canada Limited, acts as an agent with respect to residents of Canada. IEEE has selected Certain Lloyd’s Underwriters for this insurance program. Alternative insurance products may be available in the insurance market place. R&Q Risk Services Canada Limited is providing this single insurer option on behalf of IEEE. Mercer Consumer will continue to deliver the same level of service and dedication members have come to expect. Under the new name, the company will still operate at the same location with the same dedicated team and notable integrity. Please note there will be no change to the customer service toll-free number. It will continue to operate at 1-800-493-IEEE (4333). However, going forward the customer service email address will change to IEEE.service@mercer.com. The old email address will continue to operate with all emails being routed to the new email box. 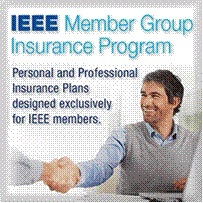 IEEE Member Group Insurance Program administered by Mercer Consumer, a service of Mercer Health & Benefits Administration LLC. Today's business world can look like a lawsuit "war zone." Disgruntled former employees. Dissatisfied customers. Project errors leading to missed completion dates and cost over-runs. But there are some simple strategies you as a technology professional can put in place today-to help you and your firm avoid the headaches and expenses of a potential lawsuit tomorrow. 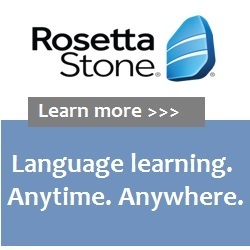 They're outlined in an easy-to-use, interactive quiz on the NEW ProLiabilitySmart eTool. In addition to helping you understand strategies to protect your firm against a lawsuit, ProLiabilitySmart highlights the exclusive coverage available to technology professionals in Canada (excluding Quebec) through the IEEE-sponsored Professional Liability Insurance Plan, underwritten by Certain Underwriters at Lloyd's of London. 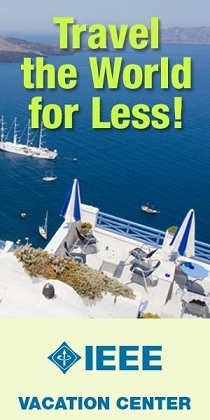 To learn more, visit http://IEEEInsurance.com/CANPLguide. The 2014 INTELEC® Conference on Energy for Communications will be held at the spectacular Vancouver Convention Centre (East), BC, Canada from September 28 to October 2, 2014. The conference will focus on "Resilient Communications Energy for our Connected World”. Last date for submitting the abstracts: March 14, 2014. In addition to making technical contri bution to EPEC 2014, bring your family to enjoy the culturally diverse, creative and cosmopolitan city with a warm welcoming spirit. The 2015 Canadian Conference on Electrical and Computer Engineering will be held in Halifax, Nova Scotia, Canada from May 3rd to 6th, 2015. 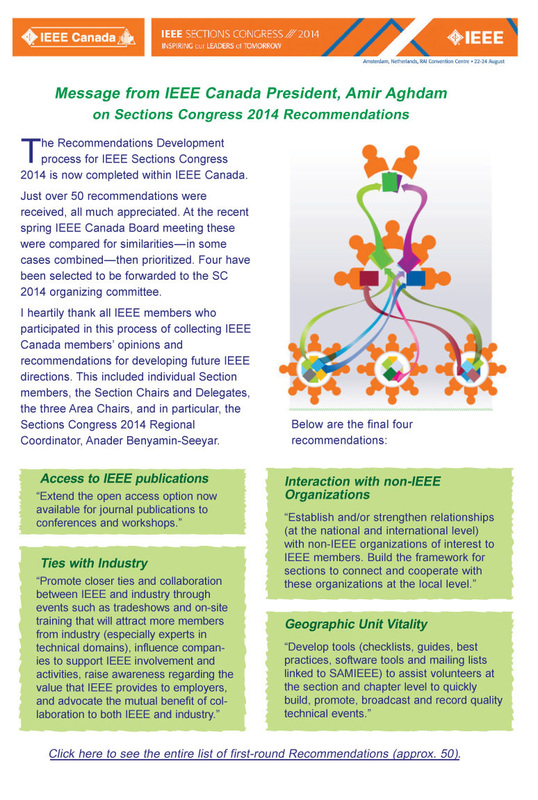 CCECE 2015 provides a forum for electrical and computer engineering research and development from Canada and around the world. All papers accepted by CCECE 2015 will be indexed by EI and included in IEEE Xplore. QBSC 2014 continues a tradition begun in 1962. Founded to address the need for developing Canadian expertise in the new field of telecommunications, the symposium is the first of its kind in Canada and continues to foster greater understanding in the fields of coding and information theory as well as telecommunications and signal processing. The 2014 IEEE International Humanitarian Technology Conference (IHTC) will be held in Montreal, Canada from June 1-4, 2014. The conference will focus on humanitarian applications of technology in the general areas of technologies for improving the lives of underserved peoples (including aboriginal/indigenous peoples), technologies for the disabled, health-related technologies, humanitarian engineering educational programs, and technologies to assist in disaster situations. The conference will feature outstanding keynote speakers, workshops, a student paper competition and peer-reviewed papers. Technology-oriented papers and papers describing social and economic factors related to humanitarian technology implementation are welcome for the conference. 2014 IEEE 15th International Conference on High Performance Switching and Routing will be held in Vancouver, British Columbia, Canada from July 1 to July 4, 2014. Vancouver is world renowned for its diversity of many cultures and ethnicities. It is an ideal place for scientists and engineers from around the world to gather and share their ideas. Past HPSR events were held in Heidelberg (2000), Dallas (2001), Kobe (2002), Torino (2003), Arizona (2004), Hong Kong (2005), Poznan (2006), New York (2007), Shanghai (2008), Paris (2009), Dallas (2010), Cartagena (2011), Belgrade (2012), and Taipei (2013). With the unprecedented growth of the Internet as a backbone for communications and information services, it is essential that researchers gather to share their ideas and progress on solving the future challenges that the Internet faces. They include bridging the digital-divide and providing advantages of the Internet to developing countries; handling the bandwidth and delay requirements of multimedia, P2P, and cloud computing applications; implementing IPv6 and migrating from IPv4; deploying large data centers and enhancing their switching capabilities; and achieving energy efficiency of switching and routing equipment. These are only a few of the topics that have demanded switching and routing capabilities that are more intelligent, efficient, and reliable then ever before.